Hi friends, tonight I get to share with you a little towel set for my darling nephew Henry. I gave you a little glimpse of it last week...or rather 2 weeks ago :). Here are a few more pictures so you can get a better view of the hooded towel and washcloth. I found the tutorial at Sew 4 Home. 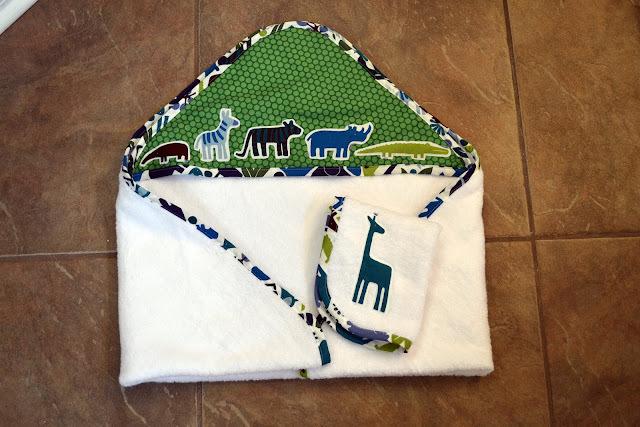 I used an Alexander Henry print for the binding and I cut out animals from that print and appliqued them to the hood and to the little washcloth. I a sucker for animal shapes! For the towel I bought a RE Fast Dry towel from Target and cut it down to size. There was enough left over to make the wash cloth, and a second one actually if I wanted to. If I were to sew this up again I would possibly change the sizing of the hood. I'm not sure if I just made a mistake reading the directions but I measured 15 inches down from the corner to create the triangle. When I make this set again I think I will shorten that to 13 in. It just looked so huge even on my 3 y.o. head. Lu so did not want to model this for me. Thanks buddy! Anyway, I loved making this. It was pretty easy and with out the applique you could definitely make this in under an hour. Do you know anyone who needs a new baby towel set?